If anyone has information about the two suspects seen above, you are being urged to call Detective Stambook at (562) 254-4921. 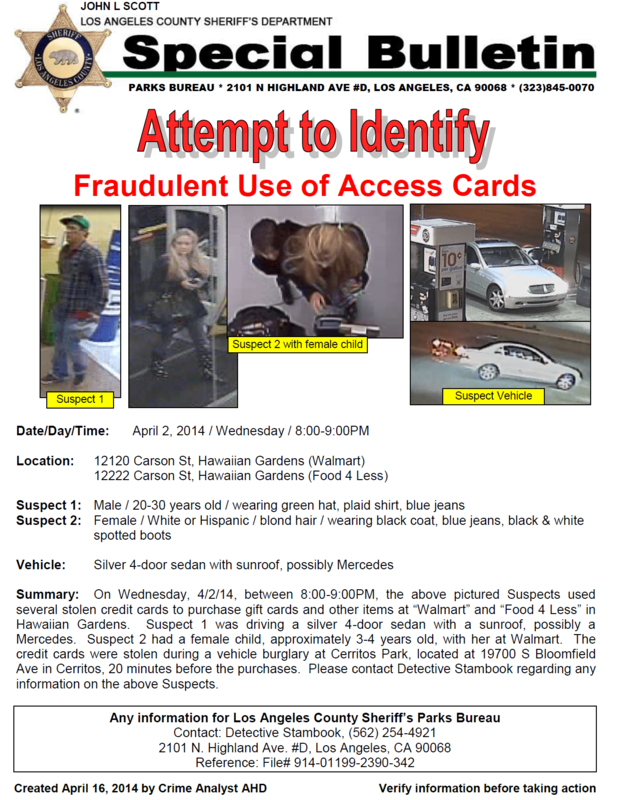 Residents in and around the Hawaiian Gardens and Cerritos area are being asked by Detectives from the Los Angeles County Sheriff’s Department Parks Bureau to be on the lookout for two suspects who are wanted for the Fraudulent Use of Access Cards. According to a media spokesperson with the Sheriff’s Department, the suspects used several stolen credit cards to purchase gift cards and other items at two stores located on Carson Boulevard in Hawaiian Gardens. Sheriff officials also released detailed information about the two suspects. Suspect #1 is described as a Male, 20-30 years of age, wearing green hat, plaid shirt, blue jeans. He was seen driving a silver 4-door sedan with a sunroof; possibly a Mercedes Benz. Suspect #2 is described as a female, White/Hispanic, blond hair, wearing a black coat, blue jeans, and black and white spotted boots. She was seen with a female child, approximately 3-4 years of age. The access cards used in this crime were stolen in vehicle burglary at Cerritos Regional Park, 19700 South Bloomfield Avenue, Cerritos; twenty minutes prior to the purchases. If anyone has information about the two suspects you are being urged to call Detective Stambook at (562) 254-4921.